Among all the interesting stuff shown for the 3DS, a trailer for Luigi’s Mansion has been shown. According to Mr. Reggie, the game features not one, but more Mansions. Moreover, the game will take “great advantage of the 3D technology” (paraphrased). 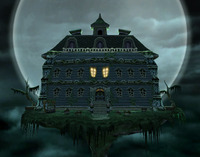 The trailer did not show much unfortunately, Luigi still has his faithful vacuum, there are some new ghost designs and it seems that Nintendo has a very loose definition of “mansion”, as one of the scenes shown was an Egyptian tomb. Oh and yes, Luigi is still a coward.